RebateBlast at The Power of Pink! October is Breast Cancer Awareness Month. This annual campaign saves lives by increasing awareness of the disease and encouraging the public to take steps toward early detection. Awareness takes the form of support systems for women undergoing treatments and their families who love them. It also includes fundraising to support research toward a cure as well as providing diagnostic breast care services for those in need. The National Breast Cancer Foundation (NBCF) has made a lot of progress in alerting the public about the issue, but there is still a long way to go. 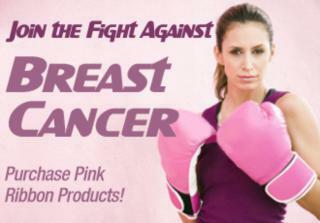 Here are some easy steps you can take to join in the fight against breast cancer. The best way to fight breast cancer begins by establishing an early detection plan. Set a plan in place for yourself and become proactive about your health. You can start by doing monthly self-exams, having clinical exams during your annual doctor’s visit, and scheduling mammograms based on your age and health history. QVC.com up to 4% Rebate Give a personalized gift perfect for any woman on your holiday list! Special pricing and S&H offers available at QVC.com! Learn more about breast cancer at Beyond the Shock. Dedicated to educating the public about breast cancer, the site offers free videos, ask and find answers, along with inspirational stories on the fight against breast cancer. Get involved in a fundraiser in your area or start one of your own! Funds raised will help provide mammograms for women in need. In fact, 86% of the NBCF’s spending in 2012 went to programs providing mammograms, breast health services, education, and support for those in need. This is accomplished through partnerships with hospitals and breast health facilities across the country, community outreaches, and digital educational and support resources. Or, show your support through a direct donation to the National Breast Cancer Foundation or the Susan G. Komen for the Cure®. Finally, as you search for that favorite product, think pink! When shopping online chose to purchase pink ribbon products from merchants that help fund the fight against breast cancer and earn double cash back in your RebateBlast account. It’s a win-win for all!